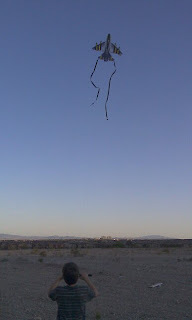 A Mom with a Blog: Kite Flying... It's A Breeze! It's a breeze! Get it? A couple of weeks ago I bought kites for my kids. They looked pretty cool. And it's cheap entertainment... right? Something we can all do together? Well... That's what I was thinking! Great minds think alike! 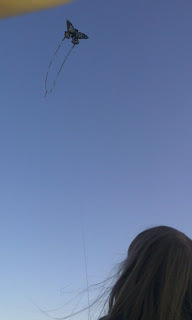 My kids had never even flown a kite until last year. Seriously. And even then, they would never have owned a kite if my dad hadn't given them one. It was a cute little pink piggy kite. 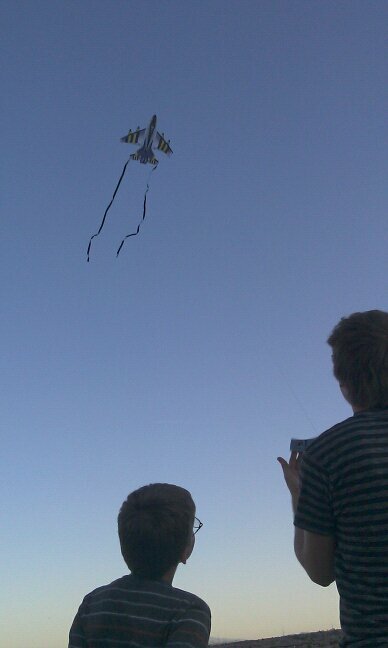 Not only my kids, but a couple little boys at the park as well, got the chance to fly their first kite. Yep, this is next year! And when I saw those cool looking kites, that poor piggy kite came to mind and I HAD to buy them... in his memory, of course! So glad I did. These are really cool kites! I know I said that.... but it's true. They fly much better than anything I'd ever flown. Who didn't know that? LOL. After 30? years I guess they were bound to improve. Kite flying is one of those fun childhood pastimes. Don't you think? I've been trying to let my kids experience some of the things I did when I was a child. You know roller skating, bike riding, and kite flying. (And just using your imagination...) It was all fun. And it still is. We just need to remind them how much fun we had when we were young(er). This is my Baby Girl flying her butterfly kite. Really colorful and durable. Not like the paper kites I remember. This is my Young Man teaching his brother, Baby Boy, how to fly his jet kite. And now Baby Boy can fly his own kite. We just drive to the desert at the end of our street. It's a safe place where we won't hit anyone if one of the kites come crashing down. You know that happens. We don't always realize it, but it's the simple things that bring the most pleasure in life. My kids were excited when they could do this themselves. I got to show them something from my childhood that is now a part of their own. They learned something new, and we had a great time together. What's your favorite childhood pastime? What did you enjoy that you'd like to share with your kids or grandkids? I know there must be something. And I'm sure they'd enjoy it too. Don't let them fool you into thinking they can't part from those video games. Take them out and have fun! Time spent together is the best time of all! Oh goodness, I well recall my childhood kite-flying days and I just have to laugh. Mine were never exactly sky-worthy, but boy did I have fun putting them all together (especially the tails). Climbing trees, paper dolls, tea parties and baseball rank at the head of my best childhood passtimes. What joy it was to be a child of the 50s! Oh my gosh! I completely forgot about paper dolls! I had so many of them. I would spend hours dressing them up in their paper outfits. They were a treasure.